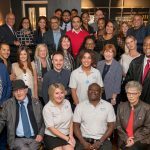 A Leicester entrepreneur who has overcome adversity, bullying and a life changing disability to become a successful businessman has celebrated at a glittering launch party after his incredible story became a best-selling author this summer. 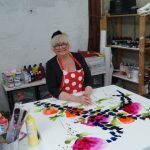 Dozens of businesses, Rotarians, friends and family from in and around Leicestershire attended the event, which was the first to be held at the brand new Queen Victoria Arts Club in the city’s cultural quarter. Guests were given the chance to hear part of Mark’s story as he was able to express his thanks for everyone’s support in helping his book, I Can. I Will. fly up Amazon’s Best Sellers Charts within just days of it being released. They were also given an opportunity to ask him questions about his journey to getting it published, along with hearing about his second appearance in London in October where he would be speaking to TV’s Konnie Huq about his experiences living with Polio as part of the Rotary’s Purple4Polio campaign. 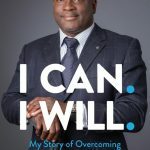 Mark Esho has been on an almost unbelievable journey to become a top businessman, and it his incredible spirit, drive and self-propelled determination which has pushed him to become the very best he can be – despite almost every obstacle being thrown in his path. In his thought-provoking and moving autobiography, Mark not only explores his upbringing and difficult childhood – but also asks the question that if he knew what his life had in store for him, would he have chosen to be born? And despite every abuse, beating and suffering he has endured – his surprising yet motivational answer is “Yes”. 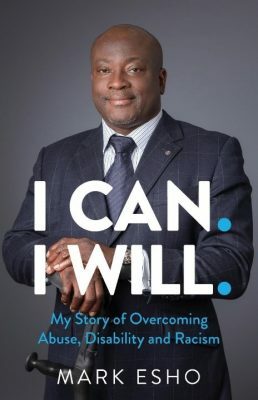 The 56-year-old, who was born in Highfields and later moved to Newbold Verdon, grew up in the county before being taken to Nigeria where his birth-mother and father lived, in their efforts to ‘cure’ him from polio. He decided to release his life story after being persuaded by friends and family that others should know how his life changed overnight into what anyone would perceive as a living nightmare. prevalent, even to this day). Doctors gave him just a 10% chance of life and Mark was left paralysed from the neck down, before slowly regaining movement. 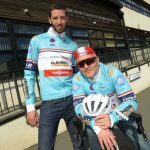 To this day, Mark still suffers from muscle damage and is unable to walk unaided. The disease is now eradicated in the UK (where there has been no domestically acquired case of the disease since 1984) and thanks to the efforts of Rotary International – almost fully wiped out across the world. Mark is proud to have become a Rotary member in Leicester, inspired by the organisation’s role in starting and spearheading the campaign for a polio-free world. Rotary International pledged to make the world polio free in 1985 when there was about a thousand cases a day in 125 countries. Last year there was only 22 cases of wild polio-virus in the entire world, however the World Health Organisation has warned if vaccination is stopped, there will be 200,000 cases in the next decade – so everyone and everywhere is at risk until it is fully eradicated. Thanks to the efforts of Rotary, along with its partners in the Global Polio Eradication Initiative, the World Health Organisation, UNICEF, the US Centers for Disease Control and Prevention and more recently the Bill and Melinda Gates Foundation, there are now just three countries still classed as endemic: Pakistan, Nigeria and Afghanistan. 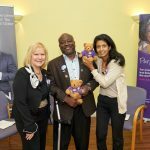 Here, Rotary International in Great Britain and Ireland has launched the Purple4Polio campaign to raise funds and awareness to help End Polio Now and forever. Mark, who is a member of Rotary, said: “It was a hard decision to write this book and I thought long and hard about it before I made that step. But I also knew my story had to be told. Not only as an incredible affirmation on why the work to eradicate this awful disease should continue and as to why children should be immunised, but also to show people that they can survive almost everything and anything life throws at them. Mark Kapur, Lord-Lieutenant of Leicestershire said he was an ‘inspiration’.“To see the determination Mark has shown in overcoming the hurdles in his life is amazing. His bravery in the face of adversity, not just once, but a number of times, is incredible, and his book is a must-read for all,” he said. The event, held at the prestigious Queen Victoria Arts Club in the Cultural Quarter of Leicester attracted guests and well-wishers from across the county, who also enjoyed a sneak preview of this luxurious new venue.